2. Section 66(1) (h) of the Principal Act is deleted. 3. Section 69 of the Principal Act is altered, in paragraph (a), by inserting immediately after the word “member” in line 4, the words, “and which signatures are duly verified by the Independent National Electoral Commission”. (b) the words, “after the coming into force of the provisions of this part of this Chapter of this Constitution” immediately after the word “Assembly”, in lines 4 and 5. (iii) “one month” in line 4, the words, “thirty days. 8. Section 107(i)(a) of the Principal Act is deleted. 9. Section 110 of the Principal Act is altered, in paragraph (a), by inserting immediately after the word “member” in line 4, the words “and which signatures are duly verified by the Independent National Electoral Commission”. (m) “one month” in line 4, the words, “thirty days”. (b) in subsection (2), lines 1 and 2, by substituting for the words, “sixty days and not later than thirty”, the words, “one hundred and fifty days and not later than one hundred. and twenty”. 145.—(1) Whenever the President is proceeding on vacation or is otherwise unable to discharge the functions of his office, he shall Transmit a written declaration to the President of the Senate and the Speaker of the House of Representatives to that effect, and until he transmits to them a written declaration to the contrary, the Vice-President shall perform the functions of the President as Acting President. (b) in subsection (2), line 2, by substituting for the words “sixty days and not later than thirty”, the words, “one hundred and fifty days and not later than one hundred and twenty”. “(2A) In the determination of the four year term, where a re-run election has taken place and the person earlier sworn in wins the re-run election, the time spent in office before the date the election was annulled shall be taken into account”. 19. Section 182 (1)(/) of the Principal Act is deleted. 21. Section 200(1) (a), line 2, of the Principal Act is altered, by inserting immediately after the word “Assembly”, the words, “provided that a member of any of the said bodies shall not be required to belong to a political party and, in the case of the State Independent Electoral Commission, he shall not be a member of a political party”. (b) the conferment on the Independent National Electoral Commission of powers as may appear to the National Assembly to be necessary or desirable for the purpose of enabling the Commission more effectively ensure that political parties observe the practices of internal democracy, including the fair and transparent conduct of party primaries, party congresses and party conventions”. (b) inserting immediately after the word “Vice-President” in subparagraphs (i), (ii) and (iii), the words, “Governor or Deputy Governor”. (b) inserting immediately after the word “Vice-President” in paragraphs (a), (b) and (c), the words “Governor or Deputy Governor”. (b) in subsection (3), line 2, by inserting immedately after the word “final”, the words, “provided that an interlocutory application may be decided during the delivery of judgment”. “(3) Subject to the provisions of section 251 and other provisions of this Constitution, the Federal High Court shall have jurisdiction to hear and determine the question as to whether the term of office of a member of the House of Assembly of a State, a Governor or Deputy Governor has ceased or become vacant”. “(5) An election petition shall be filed within 21 days after the date of the declaration of result of the elections. 30. 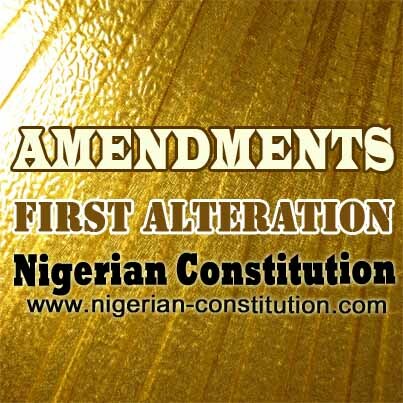 This Act may be cited as the Constitution of the Federal Republic of Nigeria (First Alteration) Act, 2010. Part I, Item 56 of the Second Schedule to the Constitution is altered by inserting before the word “Regulation” the words, “Formation and”. (b) twelve other members to be known as National Electoral Commissioners. (b) be not less than 40 years of age in the case of the Chairman and not less than 35 years of age in the case of the National Commissioners. (d) in paragraph (15)(c), line 2, by inserting immediately after the word “finances”, the words, “conventions, congresses and party primaries”. (ii) paragraph 2(1), (2) and (3).